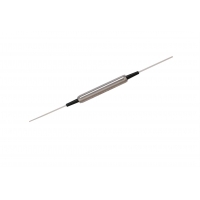 The 1950nm (2 micron, 2μm) Fiber Optic In-line Polarizer is a fiber optic component built with PM panda fiber or SM fiber. It allows light to be transmitted in only one polarization (fast axis or slow axis) while blocking the other polarization transmittion, it can be used to convert un-polarized light into polarized light with high extinction ratio, and it can also be used to increase the polarization extinction ratio of signals with its excellent polarization proerties. OF-LINK offers in-line optical polarizers work at wavelengths from 830nm to 2000nm, and high Power handling is available upon request.